Incense has been used since biblical times to create certain moods or atmospheres. Many religions use incense in their places of worship to create a sense of the divine. It is often used to bless rooms or houses or simply to create a calm atmosphere for meditation. But of course many people already know this, but what not so many people know is that incense has been used to grace places from the noblest of the halls of the elven kings to the humblest of hobbit holes! This is the most popular form of incense comes in the form of a wooden stick covered at one end in a powder which comes in different colours depending on the scent (don’t worry the powder won’t all fall off when you take the stick out of the pack, it’s stuck on). To use it put the end without the powder in the small hole in your incense holder. 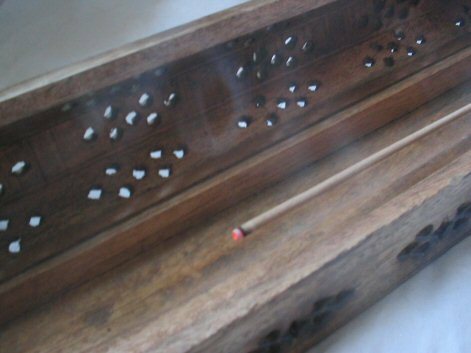 Use a match to light the other end of the incense stick (which should be sticking up in the air). After the stick has burnt for a few seconds blow the flame out. A few millimetres of the incense stick should now be glowing and smoking. I’m sure I don’t need to say this to my fellow intelligent Tolkien fans but I’ll say it anyway, DO NOT TOUCH THIS END OR KNOCK THE STICK OVER! Resin comes directly form the tree and so is the purest form, however this means it is also very strong and so only a little is needed or too much smoke will be produced. Grate the resin so that is makes a powder and put this powder on top of a piece of (unscented) charcoal (not the type of charcoal you use for BBQs). The charcoal should of course be on a fireproof surface. Light the charcoal with a match and it should spark. Don’t touch after it has been burning for a while because it will be hot even if it doesn’t look it. This comes, as the name suggests in a small cone of charcoal. This is almost always black. Put it on a fireproof surface (a lot of incense burners come with a small metal dish to burn this type of incense on). 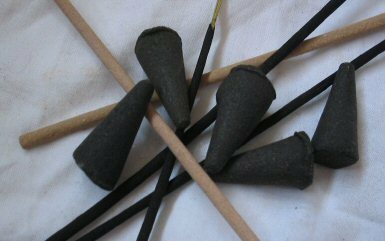 Just like the stick incense you need the light the top of the cone, wait for a few seconds then blow it out. When it’s finished you should be left with a cone of ash. Any fruit scent would be lovely in a Rivendell room, dewberry and strawberry are lovely scents but there are literally hundreds of fruits flavoured incense. I have a lovely scent called “coca mango” which gives a beautiful airy feel to the room. Vanilla could also be suitable. Floral scents such as Jasmine and rose are perfect for Rivendell. There’s one scent that I think sums up Moria: Frankincense. Frankincense is a very heavy rich scent and is strong enough to carry through many a dwarf city. If you happen to work in the houses of healing I would again recommend frankincense. Since it has long believed to have healing powers. Sage has the same reputation. Frankincense is also used for special occasions. All these are only suggestions, it is up to you to decide what smells make you feel a certain way. Some of the incense I suggested you might not like (for example, although it has many uses, I don’t like Frankincense). You may decide that Vanilla is definitely a hobbit thing, which fine. You may also want to mix incenses to create entirely different smells. Always make sure the room you burn incense in is well ventilated. If you live with other people please check that they don’t mind the smell of incense, if they do, remember to close your door. The most important things are to enjoy yourself and BE CAREFUL WITH FIRE! This is a good idea. I must try this. This is a well-written article on an excellent subject. Thank you.